Srinagar : With the aim to promote spirit of cleanliness among masses of Kashmir, the CRPF started Swachh Bharat Abhiyan with Srinagar Municipal Corporation today. Under this drive 100 CRPF jawans with 100 SMC officials will clean historic, religious and tourists spots across Srinagar. The event was supervised under Harpal Singh, Commandant 61 BN CRPF and was inaugurated by Atul Karwal, IPS, IG-CRPF (Srinagar Sector) in presence of Syed Abdul Qasim, Joint Commissioner, Srinagar Municipal Corporation at Shankaracharya Temple. Other Officers who graced the occasion included KKSharma DIG CRPF Srinagar (South) SK Parth, DIG CRPF Srinagar (North), Dr. PC Bhuria, Commandant 144 BN CRPF AK Bhardwaj- Commandant 54 BN CRPF, Rajesh Yadav-Commandant 75 BN CRPF, AK Jha Commandant 161 BN CRPF and Jenab Manzoor Ahmed Tarray, Chief Sanitation Officer-SMC. "CRPF is always determined to bring about exemplary cleanliness in all tourist places of Srinagar which posses high religious and historical significance. Also we'll put best of our endeavors to associate School children and College students with the campaign," said IPS Atul Karwal. Jenab Syed Abdul Qasim, Joint Commissioner-SMC praised the noble initiative of CRPF, voicing his opinion on the campaign he said, "Indeed it's a commendable act of social responsibility, that CRPF has taken this noble initiative to generate awareness about cleanliness in the city. 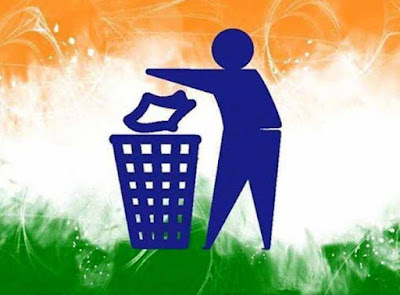 However, the Capital city Srinagar is already clean to larger extent, but the concept of associating masses with the drive will definitely generate awareness (particularly among youths) for maintaining cleanliness in such places where lakhs of tourists arrive every year." He said, "Every year, many tourists visit the historical places of Kashmir and carry the glorified image of 'Paradise on Earth.' The CRPF is dedicated wholeheartedly to maintain this status of Kashmir and extends its firm support to make Srinagar - The most favourable tourist destination in terms of cleanliness."